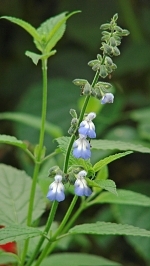 (River Sage) Native to partially shaded streamsides in Argentina and Bolivia, this is one of the few Salvia species that can tolerate wet soil. It makes a fine filler plant in a group of other partial shade growers, its wirey thin stems sending up floral displays here and there, much to the gardener's delight. (River Sage) Native to partially shaded stream-sides in Argentina and Bolivia, this is one of the few Salvia species that can tolerate wet soil. It makes a fine filler plant in a group of other partial shade growers, its wirey thin stems sending up floral displays here and there, much to the gardener's delight. In contrast with some of the flashy, brilliantly colored Mexican Sages River Sage is small and quiet. It is a perfect filler lant in containers, and brings together more distinctive elements in a mixed border. The variety we offer is clonal, a selection from the subspecies rypara 'Cuesta del Obispo strain collected in Northwest Argentina by Rolando Uria. 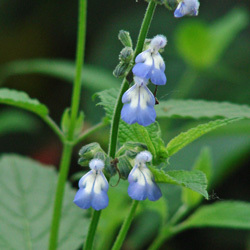 This plant tolerates deep shade almost all day, such as under dense trees or on the north side of a building. Few Salvias can do this; those that do are highly valued.